I ventured into the West Down site and noted that you had now taken up the mantle of the village historian. I had visited Margaret Thomas many years ago when I was starting my research of my family history and I have her book on West Down, which she kindly gave me. Over the past 18 years I have been gathering information on the family and its connections with West Down. It has been passed down through the family that we came over from Wales to defend the Duchy of Cornwall against Cromwell. It is possible as William Seymour, Marquis of Hertford crossed from Devon to South Wales to raise forces to defend Devon and Cornwall in 1642; but it all ended in disaster at the Battle of Torrington. The earliest records of the Phillips family are in Braunton in 1662. They moved to West Down in the 18th Century. The photograph of old West Down shows what was the village forge on the right hand side where my ancestors were blacksmiths. tt when it became the village Post Office, and my great great grandfather, Thomas Phillips, was the first postmaster in the village. He had previously been a blacksmith as had his father and grandfather before him. Thomas did not want his children to stay in the village as there was little future unless they wished to become agriculture labourers or domestic servants, so he packed them all off to London. He sons were educated at Chandler’s School in Barnstable and his daughters possibly locally. Their first daughter Anne led the way to London working for a cousin of her mother (Clogg or Clougg) in Islington where they had a costume and mantle business. Anne married Edward Anderton and later moved back with their family to West Down and lived at Trimstone House for the rest of their lives. Edward, I believe, became squire to the village and there are windows dedicated to both Edward and Anne in the church. One of their sons Edward, who is on the war memorial, was farming in East Africa when the First World War broke out. He joined the East African Forces and spent the war chasing the illusive Colonel Paul Von Lettow-Vorbeck, the German commander and his forces around Tanganyika. Due to lack of communications they did not know the war had ended until 21st of November 1918. He died seven days later from the great flu pandemic. Two of Thomas’s brothers emigrated to Australia in 1849. Llewelyn Phillips on the war memorial is the grandson of one of them (Philip Phillips). He was killed serving with the Australian forces on the first day of the battle of Polygon Wood in France. Thomas had a brother William who was an edge tool maker in the family forge in the village. Two of his sons also went out to Australia, obviously encouraged by their two uncles. There are a great number of descendants living there today. All the children were successful in London. The youngest daughter, Katherine returned to West Down to look after her parents in their old age and when they died she married Rev. William Chorley Loveband, the vicar of West Down. My great grandfather Aaron at the age of 16 was sent to London as an apprentice to a linen merchant in the City, but in 1858 he was sent home during “The Great Stink of London” when in June inadequate sewers and record hot weather turned the Thames into an open sewer. At that time it was thought that diseases such as Typhoid and Cholera were transmitted by foul air and not by water. Consequently he was sent back to West Down for the whole of June, where he wrote a diary of life in the village. It gives a wonderful insight into village at that time. He inherited money from one of his mothers uncles which enabled him to start a drapers business in Northamptonshire in 1886. Aaron’s brother Henry became an woollen serge manufacturer in North Tawton, becoming a leading member of the United Reform Church and a J P. There are many references to him in Margaret Thomas’s book, including the penny lecture he gave in West Down. I thought this might be of interest as it concerns the immigration of a West Down family to Australia. Philip Phillips and Jane Slocombe, the daughter Thomas and Mary Slocombe (nee Coates) had married in 1838 at the West Down Independent Methodist Chapel. Philip and Jane took their four children with them, Jane was pregnant at the time and their fifth child Ellen was born during the voyage, Philip was the brother of Thomas Phillips, previously mentioned as the first Post Master in the village. Philip’s brother Henry and his wife Elizabeth Pope were also on the same boat. They sailed on the 640 ton barque British Empire from Plymouth on 6th February 1849 on what was to become one of the most notorious voyages of that era. 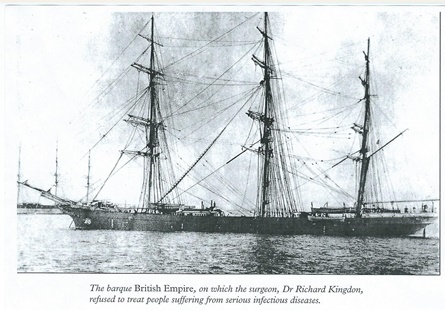 It soon became evident that the ship’s surgeon, Dr Richard Kingdon was insane and unable to treat the 240 emigrants properly. The passengers included a large proportion of people described by him as ‘Irish beggars’; immigrants escaping the dreadful ‘potato famine’. During the 121 day voyage to Port Philip (near Melbourne) forty-two separate complaints were made concerning the incompetence and neglect of the surgeon and altogether three married women and four children had died in often extremely harrowing circumstances. When Philip and Jane arrived in Melbourne they could not find work so they boarded the “Raven” with other migrants and set sail for Portland where he worked for 6 months before moving to what was to become the town of Hamilton. Henry, who worked as a carpenter for the government in Portland, and his wife Elizabeth had two daughters, only one of which married. The married daughter had nine children, surprisingly none of which married, consequently that line of the family died out. There is a letter which Jane wrote to her father and part of this letter is transcribed in the Appledore Maritime Museum. I have tried to find out where the original letter is located but without a result. Do you think anyone in the village might know where this letter is? I think there might have been two classes on the boat as Philip and Jane did not suffer as much as some of the other immigrants.